The same night, a little further along the beach, a sandbank with tiny waves flickering along, transparent and alive as little fish. I found it very calming, for a few minutes, to watch these lines of energy arriving and dispersing in the late afternoon sun. I seem to remember that I took this photo myself as a kid, maybe I was twelve at the time. 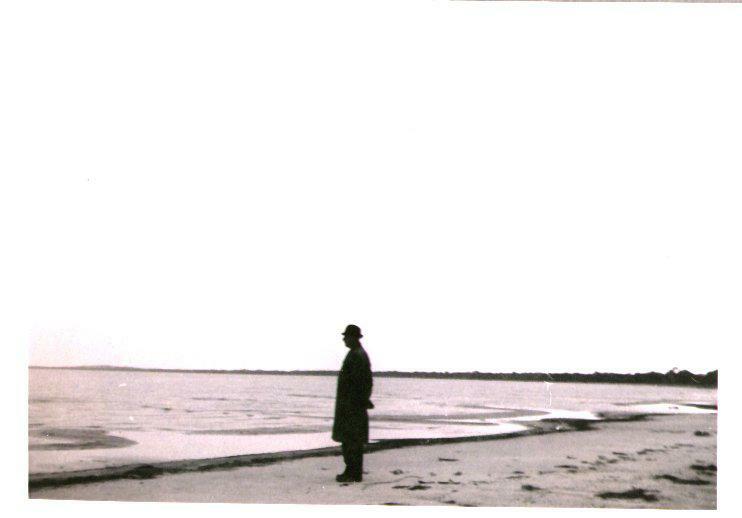 It’s my grandfather standing on the edge of Lake Hindmarsh in the Wimmera region in Western Victoria. I remember fishing there and in the Wimmera River. Even then I liked the silhouette of my grandfather here in this shot, liked that it was black and white and liked that I think I captured something of him in a landscape he loved; he grew up in nearby Diapur. So, next week I’m happy to be heading up to the lake again, and hope to see it full of water again like it is here. It’s been dry for a long time, and I think that seeing it again will be somehow restorative. I was pleased to see that Famous Reporter magazine has chosen to publish my poem ‘Waking in the Blue*” in its most recent edition. 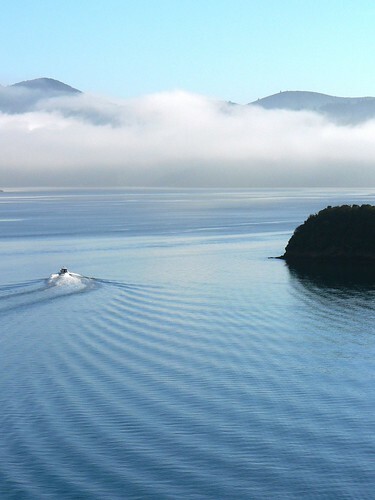 I wrote it in New Zealand while staying at a ‘bach’ perched over the Marlborough Sounds, owned by some friends. We woke up almost surrounded by water, with the sound sometimes as smooth as glass, othertimes wild and swirling with water being thrown into the air. The picture above is one I took there in January this year. Walked this morning through the Briars park; doing the short walk and checking out a koalas on a fresh cool morning. Good to see more water in the dams and the creek flowing again after a couple of dry years. Walking back to the car, saw some little trees that had been blown down in the last storm, all cut up into neat pieces, with the vivid colours inside them clear and orange almost.